As in fairy tales we stand uncertain at crossroads. The starting point is Korissia, the harbor of Kea. 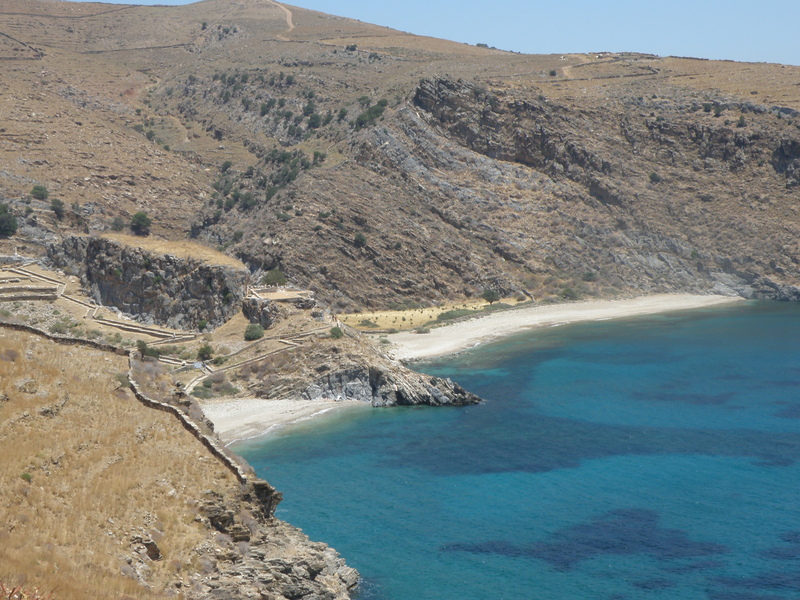 The Cycladic island is also known by its other name Tzia. We drive to Kato Mera (Katomeria) following the road map. We stop at the parking lot to eat omelettes and drink coffee. While our breakfast is prepared we walk to the stone shed hidden behind some houses of the village. We look at the posters containing photos and information about the archaeological site of ancient Karthaia. I discuss with my friends about the location of this info booth and we all agree that it should be transported or repeated right in front at the harbour as the newly arrived reach the island. More people will be benefited from knowing about the place and be challenged to walk to Karthaia. 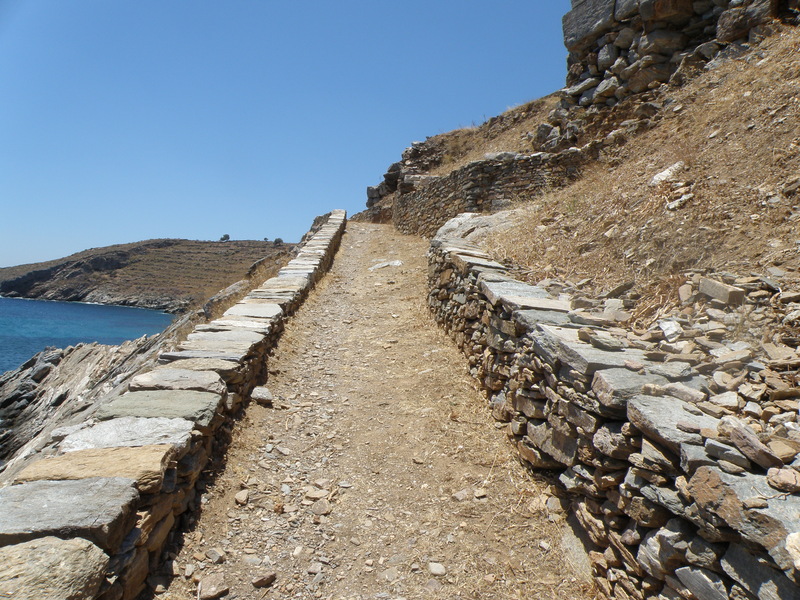 Karthaia has been one of the four city-states of the island of Kea, on the SE coast. It has been inhabited uninterrupted from the end of the Geometric period to late antiquity – in the Archaic period it has flourished. The site has been visited since the 17th century. 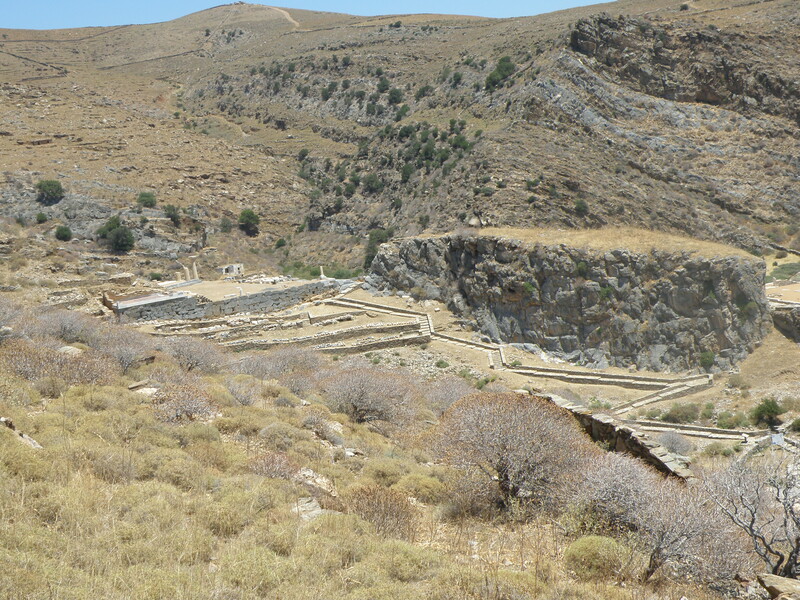 The excavations began in 1987 and continue with European funding from ESPA. They have uncovered ruins of the temple and the terrace of Apollo (530 BC), the temple of “Athena” (500 BC) building D, the propylon and a theater with 2.000 seats. We choose to reach Karthaia walking the trail that begins from Kaliskia beach. So, we drive to Havouna. We see signs ‘Private space’, but ignore them until the road takes us to an isolated house. The dog bounces friendly and a man signals to us to make a U turn. Returning to the crossroad again, we meet an older man riding his donkey who points with his stick the dirt road along the seashore. After passing by two amazing beaches we reach Kaliskia beach. We start walking trail No 7 easily. The shrubs are low and the stones of the stonewalls (xirolithies) are relatively stable each time we climb over them. 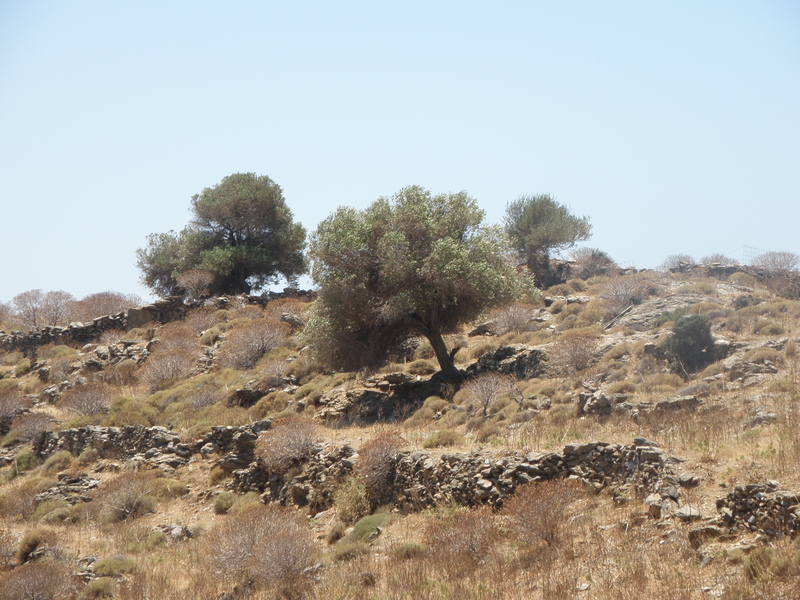 Sparse trees in an arid ground, stones, more stones, and a light sea breeze to lighten us up. In our backpacks we carry cold water, vegetables and ring-biscuits (kouloures). Karthaia has no water or any shop, mind you. The only opening through the tall stonewall that stretches around the field as far as we can see is this metal door. We find it locked with a padlock. The fence is tall, with a rusted wire on top. It takes us a while to straddle the fence from a lower point helping each other. We climb from one stepping stone to the next. The ruins of the theatre are visible and on top the broken columns of the temples. We watch the swimmers. Some seek a shade under the sheds, in the chapel and the warehouse. It is Sunday. As we descend we see the contemporary buildings made of stone in the local building tradition. If I am not mistaken some of the materials to build them had been carried via the paved ancient path. I have walked another time – it is stiff and hilly, I did not recommend it for today. Some people are still working here, in the excavations.The archaeologists recover slowly the theater ruins from evanescence, they recover memory from amnesia. It ignites in me a desire to learn more about history, how all this was build, what was the purpose, the function. I want to better understand how life has been here, the people that had worked, loved and made rituals. To learn how nature has been perceived in the ancient times. We want to reach the second bay of Karthaia – Poles. We have to cross the path that connects the two bays. The silent graves of Karthaia ground us and remind us of the minuscule point we occupy in the continuum of space and time. We relish the tranquility, the harmony of the landscape merging with the lines of the ancient site. 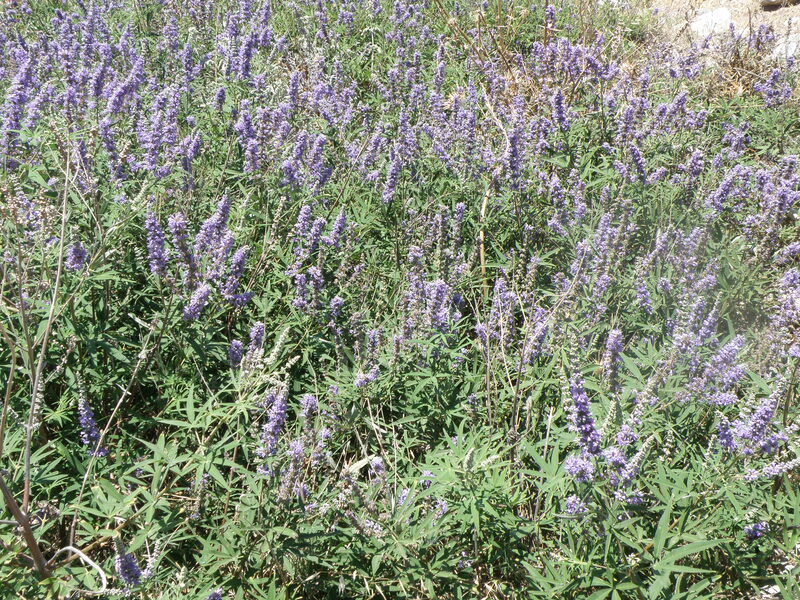 We breathe in the blooming lavender, the thyme, the breeze from the sea. It all unfolds and relives our Mediterranean memory. city-states of Kea. They were paved for their greatest part. All around there are traces of mining activity and agricultural cultivation. We drop into the water after 45 minutes of walking. 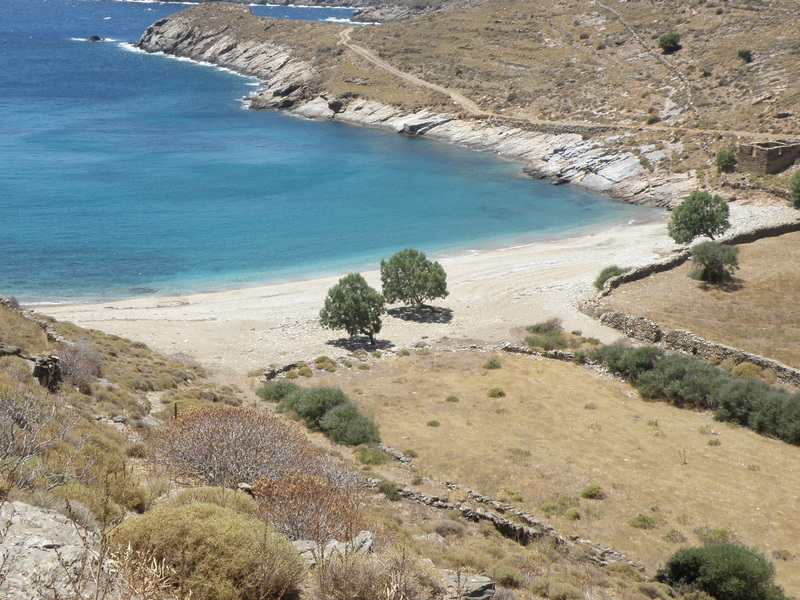 After an hour, and a picnic on the beach, we return to the first bay of Κarthaia-Poles with our backpacks lighter. All the people have gone. We recline on the built benches in the portico of the warehouse. chucked up on the beach. Karthaia is a paradise, few people work here to preserve and keep it in this excellent condition, mostly volunteers. Nature, beauty, tranquility, water, the clean sea, the fish… nothing is to be taken for granted. Everything asks for our proactive engagement. The least we can offer back is to spread knowledge and help to raise awareness. This post was first posted on July 2, 2012. My photos and info provided in the blog are related to the date of the post. Please check for updates before you visit. Find out more about the alternative path to Karthaia. 5 years later, on 15th May 2017 Karthaia is among the winners of the 2017 European Union Prize for Cultural Heritage / Europa Nostra Awards for CONSERVATION. 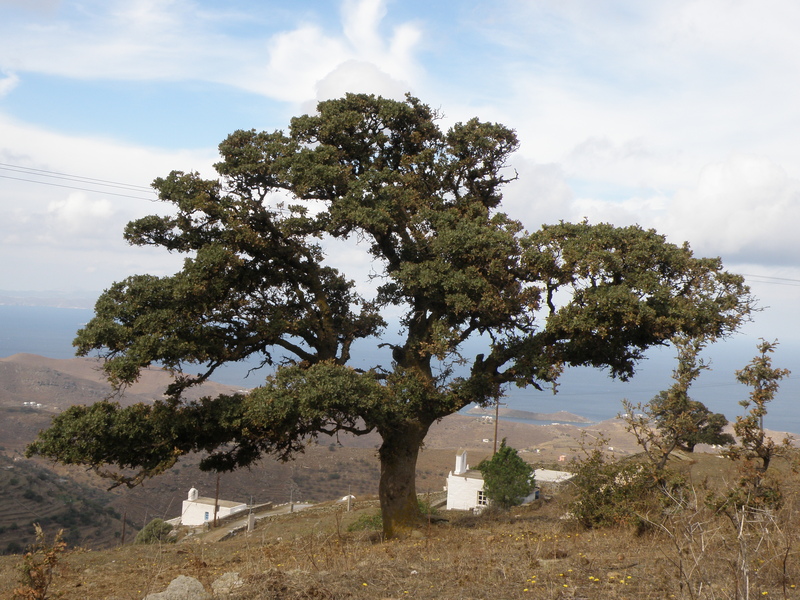 If I may suggest, do not miss to walk to the historic lighthouse of Kea (preview my post http://to.ly/jEbB). It is most interesting to ‘re-read’ my native country through the eyes of foreign travelers, look forward to read more of your posts, Ron. Hi, I’m home after 17days and my time on Tzia with a little SUV and friends, of course. The hidden beaches draw me. 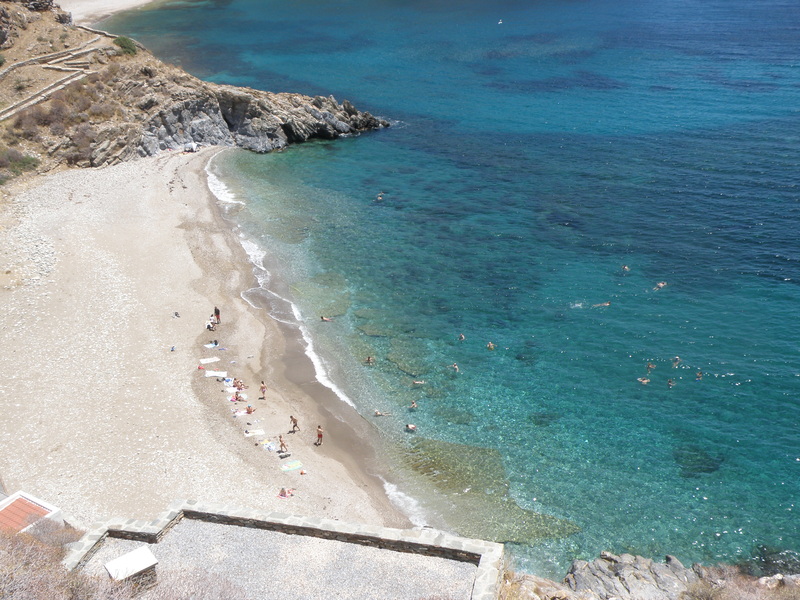 Spathi without a paved road on the East coast gives the traveler an unspoiled gin clear beach cove. Quite a trip of cliff driving. A new taverna/bar is perfect. Great choice. I wish you to come back, there are so many more islands and coasts to see, it is true, you are never tired or bored ..esp. for you ‘vastlycurious’, there is a lot to explore!